So, i'm going to be 22 next week! Its a pretty boring age. I officially feel old! I've been hinting at a few bits recently. 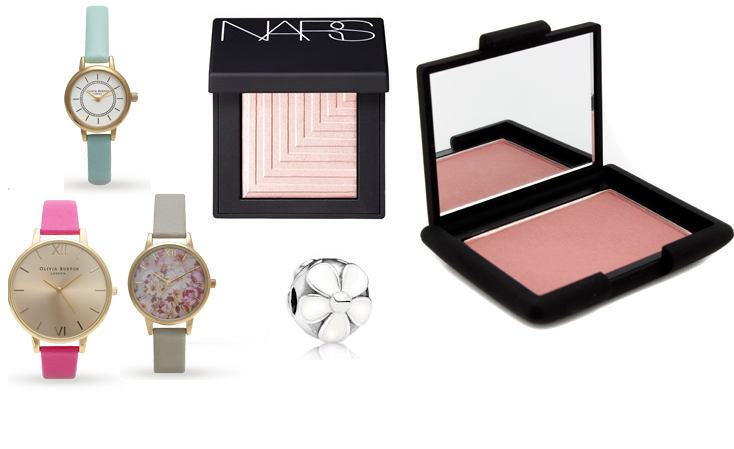 I'm going to be spending my birthday in Gran Canaria so i'm hoping to pick up a couple of bits from Duty Free, but they don't stock Nars but i've done some serious hinting so I should get these bits for my Birthday. I got a Pandora bracelet off Clint for our anniversary and its looking abit bare without a charm so i'm hoping I get one. I've had my eye on these gorgeous watches from Olivia Burton, i'm planning on getting myself one as a little birthday present from me. The Olivia Burton watches are gorgeous!